While thousands of people speculate on stocks daily, Livermore argues that few of them do so profitably. In his opinion, the speculator's deadly enemies are ignorance, greed, fear and hope. Making it difficult to make money is the amount of noise reported by the media. Livermore makes fun of a few headlines and articles where market pundits state their case, but for which there is no basis. But the public loves to receive (and act on) tips. As such, there will always be people there to provide them, for their own gains of course. Brokers are one example of a class of citizen which prospers when the public buys. As such, whether times are good or bad, brokers just want commissions, and so they will offer advice that gets the public to purchase stock. 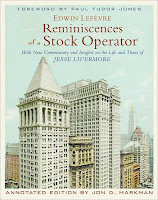 Livermore ends the book by stating his belief, with all of his years of experience now, that no trader can consistently and continuously beat the market.